Minimalist living – tiny houses, owning 15 things – how low can you go? I read grist.org almost daily, where normal article topics run the gamut from local food and climate change to green building and sustainable urbanism. There is a facination in this community (my online community) for tiny houses and people who own less than 15 items. I am cautiously inspired by both of these thing. They are, arguably, valid proxies for living lightly, sustainably, and more carbon-neutral. Certainly they present a happy fantasy of a life less like mine – house cluttered, dirty, overwhelming! I’ve often wanted to throw 15 things in a backpack and leave it all behind. I feel perfectly comfortable living, short term at least, in 10×10 cabins, even sharing with other people. So these things do inspire me, and some of it is good – I have paired down my moderately useful, mostly sentimental stuff a bit. But, perhaps just defensively, I can see problems too, some of which I’ve brought up before. If you don’t own tools or have a place to store tools (doesn’t have to be heated – and a lot of tiny house owners seem to have even larger out buildings! ), you might have a hard time keeping your necessary infrastructure up and running so that you maximize its useful life and don’t have to chuck it for new. If I had lots of money I could ditch the sewing kit and take all my clothing repairs to the corner alterations shop, but a quick and easy, almost costless patch job would end up costing over $10. I could take my bike in for all repairs, tune-ups and adjustments. I could hire repair people for anything that goes wrong with my building or stuff. And if I did make lots of money that might not be so bad – rent everything possible instead of owning (perhaps even my space), hiring professionals to do all repairs so that they have the tools, not me. That is actually a much more efficient allocation of resources, than everyone having their own. But my bike has the pesky habit of breaking at 10pm when I have to get to a friends house, it seems crazy to call a repair person to replace a single screw in a hinge, I’m not made of money, and I enjoy doing things myself. Another good option is having a tool library or rental pool or some such, and that is the joy of intentional communities and groups where you can live in close proximity to the tools you need to borrow and have 24/7 access. Like in college, where I had the key to the bike shop and could go in at 2am to tune up my bike, as could anyone else on campus checked out on it. A lot of people who don’t own much seem to be in situations, like school or traveling the world, where there is this infrastructure to support not having to own everything you use. As far as tiny houses, in my climate it is a little silly. For thermal efficiency, which is very important in this cold climate, it makes sense to share walls. Indigenous people tended to build houses, that while small, were built big enough to house several nuclear families. I’m all for small personal floor spaces, but shared common areas and multiple units within one shell seems a given to me here. Again, I see a need for enough space, perhaps unheated, for tools (shared at least) and some ‘junk’. If I didn’t have a scrap dimensional lumber pile (say, due to lack of storage room I just burned it all or gave it away), I would have had to find or buy new to build my chicken coop – more resources needed in the way of wood and transport fuel to get it to me. And just because you live in less than 300 sf or own only 5 things at a time doesn’t mean that you don’t jet all over the world or drive a gas-guzzler, though I’m sure generally a full set of sustainable behaviors would go together (and I’m certainly not perfect on any of these things). But I’m considering a better measure of sustainability in living than how much floor space you have or how much you own – amount of money you live on. Again it is not perfect, somethings in our world are artificially cheap (fossil fuels), some worse options are cheaper than better options (fast food burger vs. organic, grass-fed beef burger), but a lot of these distinctions break down if you follow through to even better choices – biking everywhere is cheaper than driving, cooking whole vegetarian foods at home is cheaper than eating fast food. I’m currently doing online research on this – it goes back to the roots of minimalism – the simple living movement of a couple of decades ago (Your Money or Your Life and all). I’ll let you know what I find out! Meanwhile, we finally hit breakup last week and the temperatures are over freezing during the day (40’s F the last couple of days!) and the huge piles of ice and snow are slowly but surely shrinking! No bare ground, but some bare streets and sidewalks. Transport: I still don’t own a car. My son is now catching a car pool ride to school in the morning. I bike or walk to work. 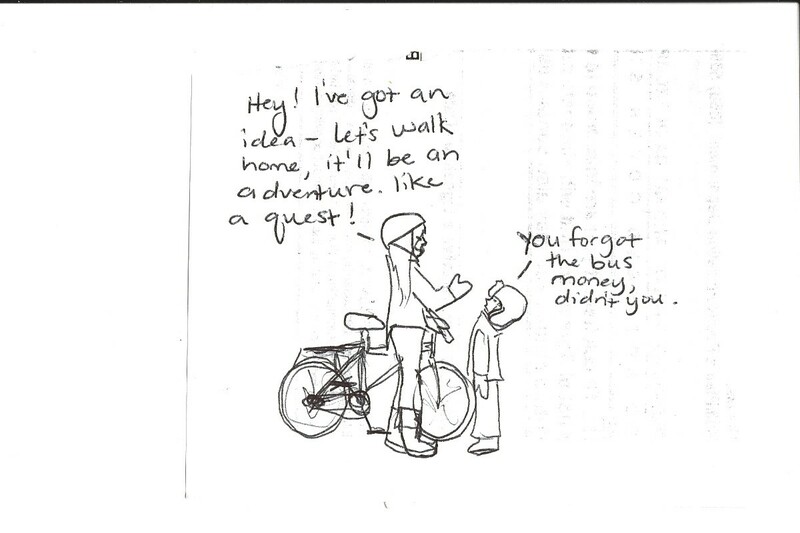 I bike to pick my son up at school on my days to do that, and then we take the bus home together, except the time I forgot my wallet (see above sketch). When I’m with James we drive most places, except nearby restaurants…that’s generally only on the weekends. Luckily even then we don’t get out much. But if I did get out to the mountains/woods more I might have a slightly better attitude… I’ve flown once since last May, to Fort Yukon to teach energy efficiency. I’ll be heading to a green building conference in Portland this May as well, and back out to the villages to teach this month. So more flying than I feel comfortable with. Food: I didn’t freeze many greens last summer, so I’ve been buying a bit more non-local veg than normal, but still mostly subsisting on local root veg. My frozen backyard fruit gave out a couple of months ago, so buying lots of shipped in fruit. Still plenty of local meat in the fridge, especially salmon. My dad does a lot of cooking for us, and I’ve fallen on the ease of store bought bread to make a quick meal (pbj, etc), so convenience dictates what I eat a lot. Most mornings my son and I start the day with eggs from our chickens though, and that I feel really good about. 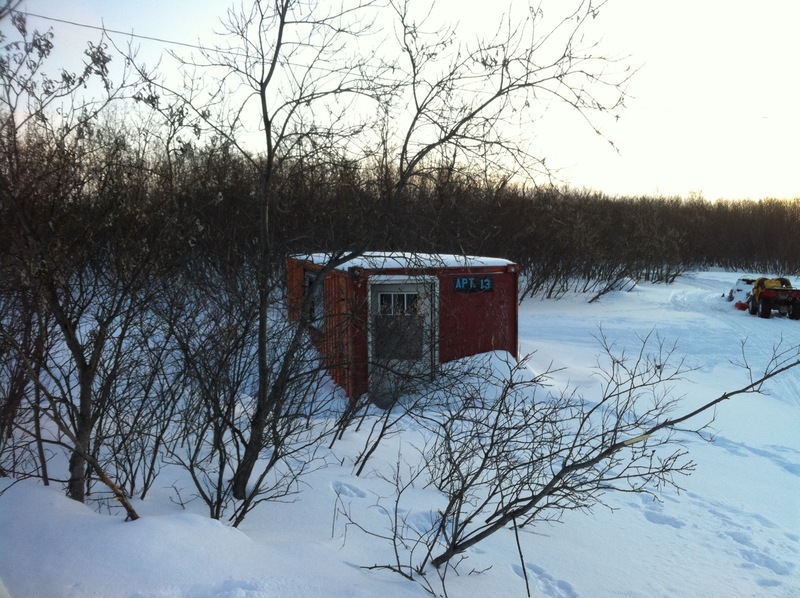 My meat freezer is in the back shed to save energy for freezing, but that may be hard on the workings of it – we’ll see. I haven’t unplugged my fridge this year like last winter, but this year I have an energy star fridge, so not so much incentive. Soon enough spring will catch up with us, even here in the icy north, and I can worry about summer efficiency – which mostly involves the food garden and maybe some community outreach/advocacy!